With their sole entry, the Smearsett flock of WA & A Booth in North Craven retained the championship at CCM Skipton’s annual registered show and sale of Blue Faced Leicester females on Wednesday 30th January. Father and son David and Robin Booth, of Old Hall Cottage, Feizor, again clinched the title with their first prize gimmer hogg, which had the same breeding as their 2012 victor, being by the home-bred B13 Smearsett, better known known as Black Tag, out of a dam sired by a £17,000 Lunesdale ram from Gordon Rawsthorne at Nether Kellet, Carnforth. With a full brother already sold for £3,800, the Skipton champion made £1,250, top price in show by some margin, when finding a new home in Lancashire with Robert Tarbatt, of Darwen. The reserve championship fell to the first prize in-lamb female from the Laund flock of John Stott, who trades as CM & J Stott & Son at Laund Farm, Chipping. 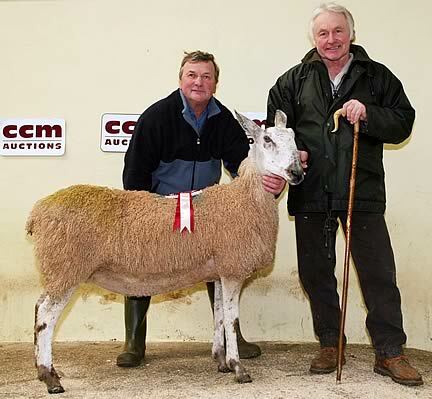 By a Mereoak tup bred by Peter Webster in Keswick and in-lamb to a Welsh-based Richard Thomas Tanhouse sire, she sold for £400 to show judge Henry Critchlow, of Buxton, Derbyshire. The second prize gimmer hogg came from the Pear Tree flock of KM & SM Sayer in Hawnby, Helmsley, while the third prize winner from the Ilkley Moor flock of Ellis Bros, of Addingham Moorside, achieved £380 when joining AP Percival, of Haworth. 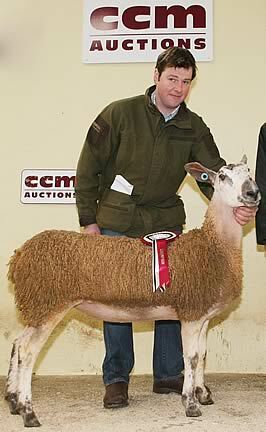 The same vendors also sold a second gimmer hogg at £300. The second prize in-lamb female from the Wharfedale-based Weston flock of James Caton, scanned with twins to a Riddings tup, made £240. He also sold two further entries at £180. The third in class from the Chelker flock of local breeders Joe and Nancy Throup in Draughton, by a Lunesdale sire and scanned for twins by a Tympany Gill tup, performed well in the sales ring when knocked down at £480. The same price was also achieved by a gimmer hogg, sired by their own Smearsett tup, out of an Ilkley Moor-sired dam, from the Oddacres flock of John and Claire Mason at Embsay. The Otterburn Lodge flock of Ashley Caton in Otterburn was also prominent with three shearlings, all scanned in-lamb to a Middleton Hall service sire. Two, both expecting twins, sold for £650, joint second top call of the day – a Swathburn-sired entry joining M&K Farrar in Healaugh, Reeth, and a Nunscleugh daughter selling to James Middleton, of Arncliffe. The third, by a Midlock ram and carrying a single lamb, became a £400 acquisition by Windermere’s Peter Webster. The 30 Blue Faced Leicesters forward were among 112 breeding sheep and 385 store lambs successfully traded on the day. Otley’s Roger Naylor sold multiple pens of correct in-lamb Texel, Suffolk and Mule entries, most achieving three figures to a high of £125, just pipped at £126 by a correct in-lamb Swaledale from JH&J Bland & Son, of Crowden, who sold further Swaledales at £100 and £98.